If, as the Depeche Mode song goes, “the handshake seals the contract,” I’m screwed. I don’t know why, but I rarely give a good one. I’m either too high, too low, too soft, too strong, shaking when I should be letting go, letting go when I should be shaking. Plain and simple, I’m a mess. I get nervous just thinking about it. I feel your pain, brother. Let’s shake on it. The good news is there actually is help, contrary to Jerry thinking that “there’s no guidelines for handshakes…” A quick Internet search reveals several sites offering tips on etiquette and techniques. Handshake etiquette? Handshake techniques? Really?! You mean there’s more to this than just traditional ritual! How come no one ever told me about that? What the hell did I learn in school? I’m still struggling as to whether or not I should initiate a handshake with a woman or wait till she extends her hand first. Don’t laugh. There’s protocol. For that sort of thing. 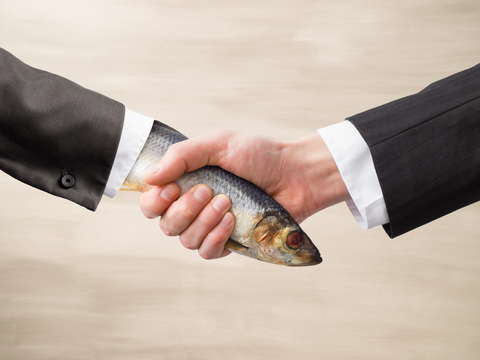 Furthermore, people form judgemental first impressions on the basis of a handshake. So it’s important to get it right. With that in mind, let’s see what it is that makes a memorable handshake. In short, hands should be soft and dry; aim for palm to palm contact; two or three pumps up and down from the elbow, not shoulder; make eye contact and a greeting. And don’t forget a grip strength of more than 300 newtons. 300 is just average, and you never want to be that. You read that correctly. Why? A recent article in The Economist titled “Getting a Grip” states that the strength of a handshake determines life expectancy. And like so many other things that Scandi folk do better than the rest of us, it seems that the Swedes’ shake is the best, hands down, which futher enhances Scandinavian strangleholld on living longer, happier lives than everyone else in the world. So not only is character presumably based on a handshake; so is the amount of time left to live. A firm one suggests warmth, comfidence, and longevity. A weak one implies insecurity and impending death. Knowing all this, it’s no wonder why I keep working on mine. But quite frankly, it can start to get a bit out of hand when thinking about how much is riding on a handshake.